Kissing 2009 goodbye in 2 hours 45 minutes, so I thought of doing portraitures of Scarlett ("Travelling with Mother...") in Tonner's "Kissing Ashley Goodbye". Among the dresses in which Vivien Leigh's beauty was highly complemented, the Christmas dress in which she desperately tries to hold on to every second with her illusion is in my opinion one of the best. Why? The innocent girlish sweetness of the dress is at variance with the turbulent mature passion of a woman that demands for love. 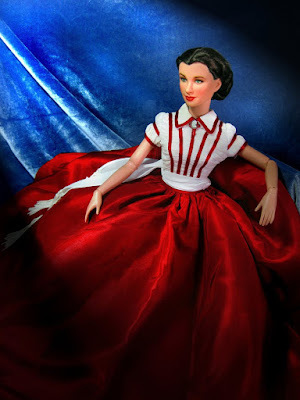 "Demand" being the operative word in Vivien Leigh's crafting of Scarlett -- whereas other aspirants exhibited "begging for love", Vivien Leigh's interpretation was unique and faithful to the characterization of Mitchell. "At variance" for while Scarlett displayed porcelain-like fragility of beauty and decorum as admonished by Ellen 'O Hara and Mammy, inwardly, she was endowed with the Irish-determination and gumption that stood out in the war-torn South. 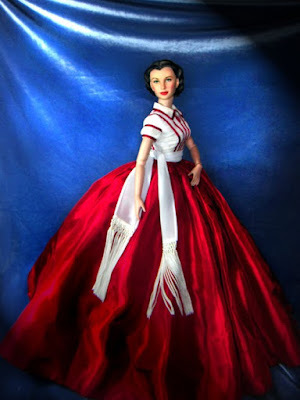 I have posted pictures of the Franklin Mint version of this dress ("How Could He Resist") which is more faithful in color, length and accessories to the film. 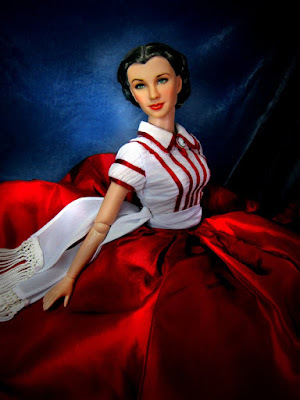 The Tonner version fails in the cameo (which was originally all black, and which I repainted to reveal that cute cameo silhouette). 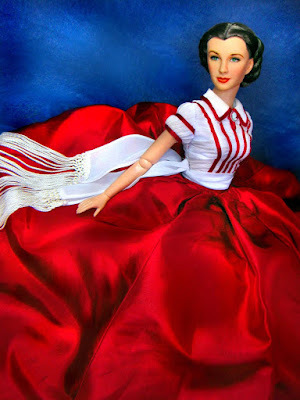 The boots of this doll is red, whereas the Franklin Mint version uses red pumps. 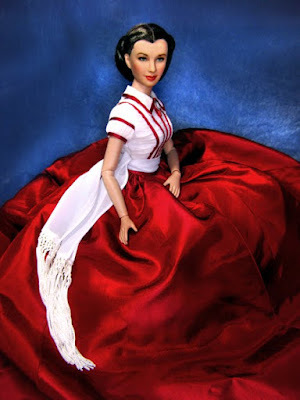 The Tonner version has a overly voluminous skirt. One has to iron the pleats (lukewarm) to tame the large skirt. I wonder how those women moved in small houses with such large skirts. As the new year ends, we kiss it goodbye: holding on to its lessons, and letting go of its sad moments. And while we hold everything in memory - be they sweet or bittersweet, we must remember to persevere...like Scarlett, we will, after the wars in our lives are over -- we will. "When the war is over Ashley. When the war is over." The blue background and red dress look great together - excellent as always! Thank you Dave! For lack of a better background I had to use a blue velvet draping. Happy new year to you too! 2010, hopefully, will be gentler on us when it comes to doll collecting. Love the blue velvet! Thanks for a great year of photos and conversation. Thank you Nikki! More than the Scarlett and the dolls, the photos and conversation get their inspiration from kind and wonderful souls like you. = ) Have a happy, happy new year!